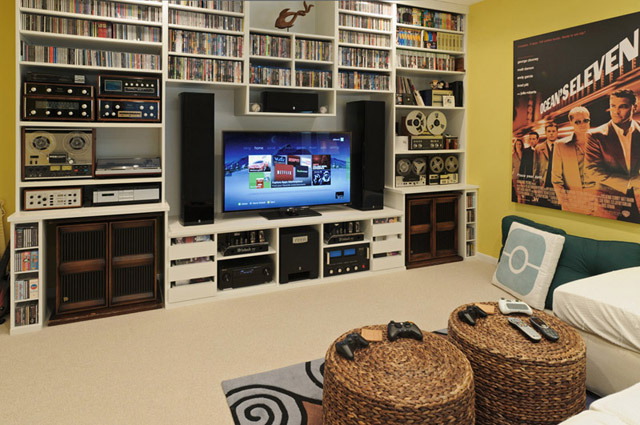 Sometimes, only a small space is available to dedicate to game play, but this can be ameliorated by the addition of multiple screens, functioning much like virtual windows. In this room, the illusion of open space is further reinforced by the clever use of a bold primary color on the far wall, contrasting with the neutral tones in use elsewhere. 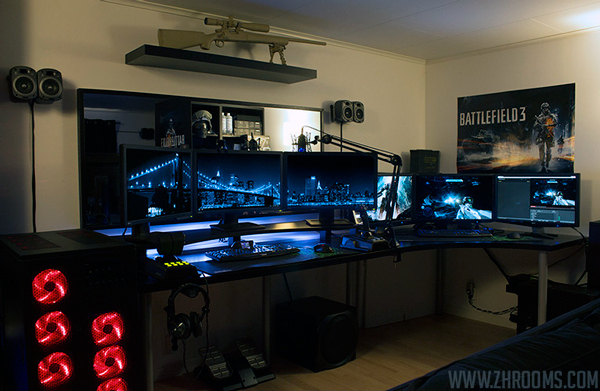 Gaming, audio, and other gear is neatly organized by the use of industrial shelving units, while a comfortable office chair with casters allows for rapid access to every component. 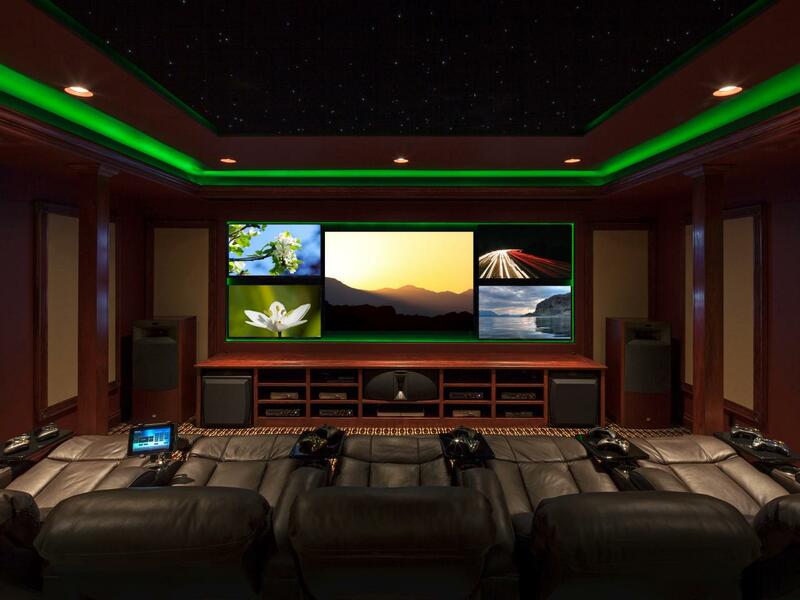 Ambient lighting is always a challenge for enthusiasts of modern game play, but this room takes advantage of this requirement by using alternative colors for illumination. Few other spaces in the home allow for bold reds and cold blues for ambient lighting, but in spaces dedicated to play, it can be a very effective choices. A framed print and a replica weapon further help reinforce the statement that this room is intended for play, while retaining a standard white overhead light provides for circumstances other than game play. Serious game players eventually acquire hundreds, or even thousands, of titles, making access to these games difficult without good organization. 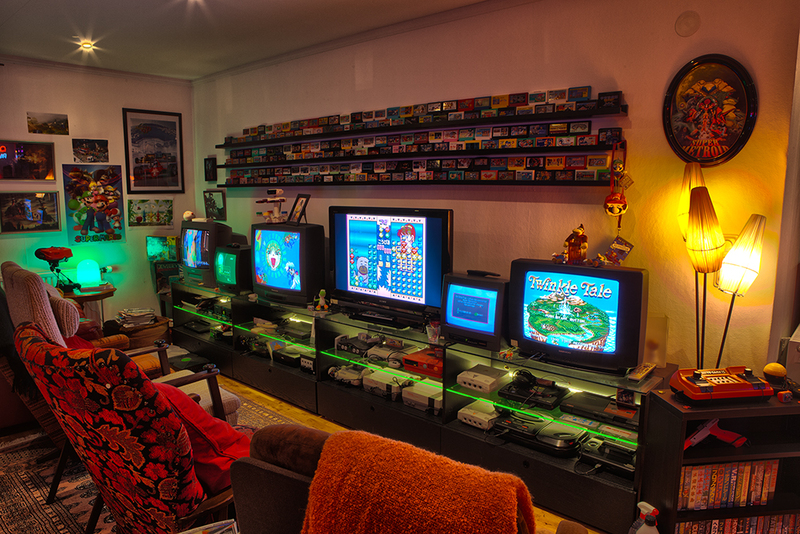 In this photo, you can see how the extensive use of custom shelving helps arrange games and other forms of media in a format that is open and accessible. The use of white as the central color is nicely contrasted with the far wall in a pastel color, adding a different visual texture with the use of a large poster. 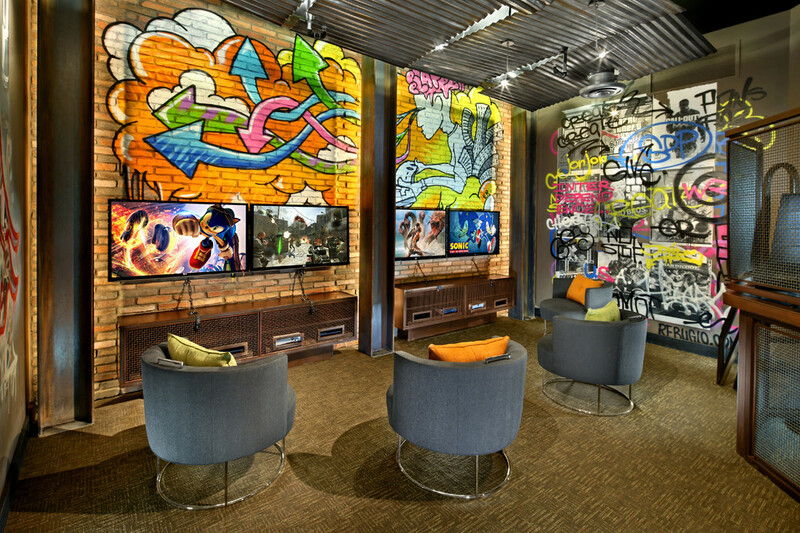 While many gamers stick to symbols, characters, and graphics from their favorite games to inspire the way they decorate interior spaces, one bold idea is to add whimsy and energy by adapting street art to the room. In this photo, a conventional arrangement of modern games is nicely contrasted with a painted backdrop consisting of bright primary colors ordinarily seen only in outdoor settings. Pastel throw pillows help add a splash of energy and vivaciousness to the room, while generous overhead lighting keeps the room feeling bright and airy. 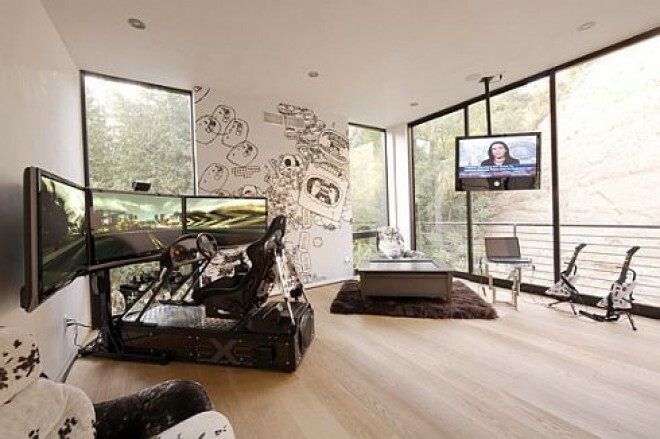 Although many decorators would take a modern, open space such as the one pictured and keep the lines simple and sleek, this gaming room takes advantage of an unused corner to add additional visual texture by the use of three wraparound screens. Dedicated gaming equipment keeps the eye away from the expansive views outdoors, and focuses on the play closer to hand. Whimsical wall art and matching furniture help keep this room looking modern, while a ceiling mounted screen helps keeps the floor space free of clutter. In this photo, the smart use of varying shades of blue throughout adds a powerful intimate energy to the space. Matching storage boxes and secondary items of furniture continue the theme, while a piece of reproduction street art adds a fun flair. 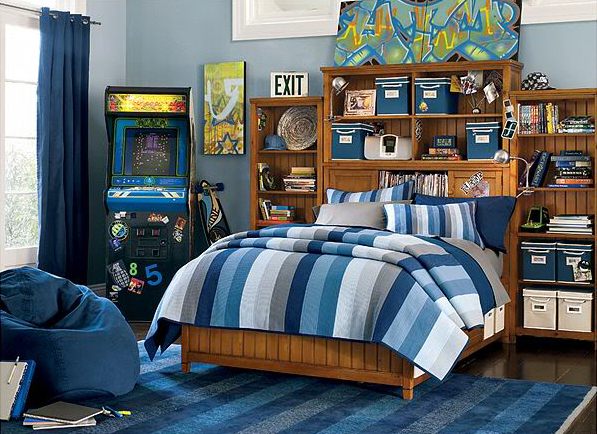 A striped floor rug helps continue the excitement, all pointing to the exciting game play to be found in the corner with the presence of a classic arcade machine. The somber dark earth tones used with the furniture and wood paneling throughout are nicely contrasted with recessed green ambient lighting, adding a unique energy to this gaming space. An enormous screen and upwards of five gaming chairs boldly announce the purpose of this room, amplified by the complete absence of any items unrelated to gaming. Special armrests allow for the tidy storage of controller devices, while a complete sound package ensures that play is transformed into a fully immersive experience. While most rooms for gamers are dedicated to play, this room instead has been transformed to resemble the interior of a starship. The clever use of futuristic recessed faux windows is nicely complimented by space gray furniture and color use throughout. Multiple framed prints from popular entertainment and a theme carpet help tie this space together, with a full-sized robot in the corner further augmenting the futuristic concept. Special attention has been given to the recessed ceiling design, truly making this room appear as though it is hurtling through deep space. Truly dedicated consumers of games often find that older console models require unique connections or screen ports to properly function. 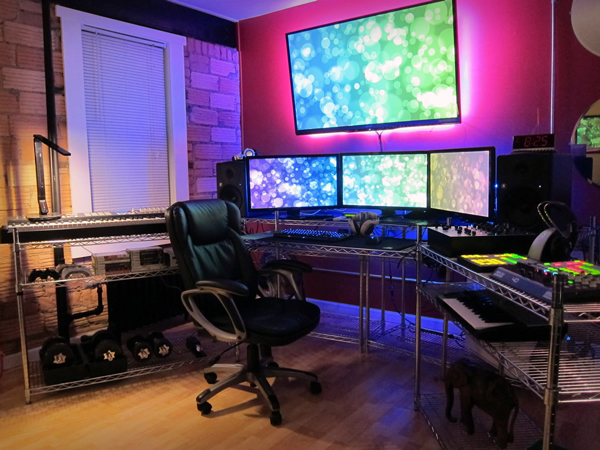 In this room, one multi-use screen has been abandoned for the installation of a half a dozen screens, allowing for plenty of space to store and connect a large collection of consoles. Framed prints and paraphernalia help tie the room together, while an ad hoc collection of furniture allows for rapid access to any given screen.